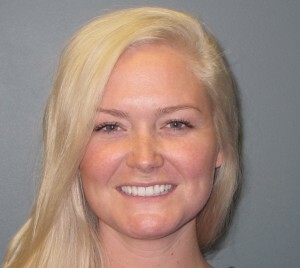 Big Welcome to our newest team member and treatment coordinator Clory! 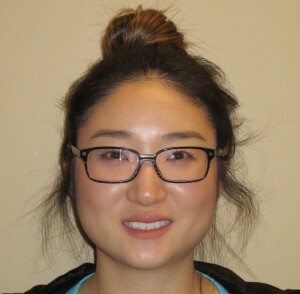 You will notice that we’ve added a new big smile to the Orthodontics at Don Mills team – Mary Lu! Mary Lu comes to us with 8 years experience working as an orthodontic hygienist! We welcome Mary Lu as part of the dream of creating beautiful smiles for our patients! 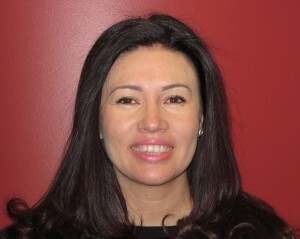 My name is Mary Lu and I am a Dental Hygienist here at Orthodontics at Don Mills. I am part of the process, from the day the braces go on, to the day they come off. Having braces myself in my teen years, I encourage others to achieve the smile they’ve always wished for. I love being part of each patient’s experience and look forward to seeing the changes at each visit. There is nothing better than the day your braces come off and you see your new and improved smile! I received my diploma in Dental Hygiene from George Brown College in 2006, and have a degree in Health Studies from York University. I am also a member of the Canadian Dental Hygienists Association. In my spare time, you can find me cooking new recipes in the kitchen, reading a good book, or going for walks around Toronto’s trails. Invisalign™: Who treats you matters. I have the privilege of working in a craniofacial hospital as a member of an inter-disciplinary dental specialty team including a prosthodontist, oral surgeons, pediatric dentists, and we have fellows and hospital dental residents who rotate through each week. I arrived one morning greeted by a nervous dental resident who said she was relieved to see me because she really needs to speak with me. She explained that she was moon-lighting doing dentistry in private practice and needed help to look over an Invisalign™ case that wasn’t working. She said it was her fifth case, a 16-year-old boy with a difficult mother who is quite upset. He wore the first series of aligners and it didn’t work, and she really had to make it right with her refinement so the family doesn’t become more upset and she needed the help of an orthodontic specialist. She had the ClinCheck™ on the computer screen ready for me to assess (A Clincheck™ is a simulation of the virtual movements the teeth will make after each tray is worn. 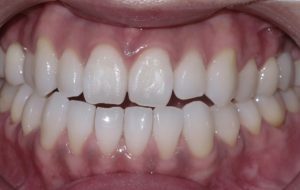 The patient can therefore have a projection of what their teeth will look like at the end of treatment. Invisalign™ provides this software to communicate with their technicians in Costa Rica. As orthodontists, we review the exact movement of each tooth in detail and in relation with their neighbour and communicate back and forth with the technicians explaining the exact biomechanical tooth movement necessary and that is biologically possible). Technology like Invisalign™ have simplified the ability for non-specialist dentists to provide orthodontic care to patients. Moving teeth through bone can be simple, however moving them “properly” through bone in the right three dimensional position so they can effectively and esthetically relate to their neighouring teeth with a resultant bite that is not uncomfortable, can be challenging. Anyone can virtually ‘manipulate’ the movement of teeth in an Invisalign video. For predictable and proper tooth movement, what is required is the rendering of a proper diagnosis of the case with a realistic and effective treatment plan. That’s where the question arises, “who should be doing your Invisalign™ treatment?” Shouldn’t it be an orthodontic specialist with advanced training and expertise in moving teeth and who does it day in, day out, all day long? If general dentists are offering orthodontic treatment, are they giving patients the option of seeing a specialist? We often are asked the question if patients are “qualified” for Invisalign™. The question that patients should be asking is if their dentist is “qualified” to be performing Invisalign™. Invisalign™ or other clear aligner systems are not a commodity but they result in different outcomes between different providers. Invisalign™ is just a vehicle for the orthodontist to take a patient through their journey, just like braces, with the goal of a beautiful smile and functional bite. 1) Are you an orthodontic specialist and is this what you do all day, every day? 2) Have you completed an advanced full time 2-3 year orthodontic residency training program? 3) If no to the above questions, what makes you qualified to be moving my teeth and are you confident you can provide the same level of care as a specialist? 4) Did an orthodontic specialist treat your smile or your children’s smile? 5) Do you develop your own treatment plans or do you rely on a specialist or outside company to do so? 6) Are you just getting my teeth straight or are you paying attention to how my bite will fit together after treatment or the specific details of my smile? 7) How many cases similar to mine have you treated in your career and can you show me before and after photographs? 8) What will you do if something goes wrong? Unfortunately, sometimes dentists and their staff may falsify themselves as orthodontists. To determine if the person treating you really is an orthodontist, you can ask them which advanced specialty training program they have attended, or if they successfully passed the royal college of dentists specialty training exam. You can also get a hint if they are doing cleanings, fillings, crowns, and other common general dental procedures. If they have a one-stop shop for treatment, they are likely not orthodontic specialists. In fact, many dentists lower their Invisalign™ fees, using Invisalign™ as a loss leader to give them ability to charge patients for regular cleanings, check-ups and other procedures. 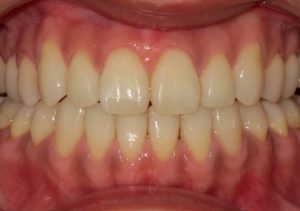 Here is an example of a case treated by a general dentist doing Invialign™ which had to be retreated by an orthodontic specialist, and the final result achieved. When I reviewed the dental residents Clincheck, I saw a lot of problems. My first question was, do you have photos? She pulled out unhelpful out-of-focus photographs which had been taken on her cell phone. My next question was if she had a panorex and lateral cephalogram? She had a full mouth series of x-rays, no panorex, no lateral cephalogram because the dental office where she was working doesn’t have the machine to take these diagnostic orthodontic x-rays. I went through the Clincheck video and saw explained to her the issues she was facing. I first ask asked her why the case was finished with a posterior open bite and no anterior coupling. Her answer was, “Well why would they leave the case finished like that?” I tried to gently explained to her that she’s the one who is responsible for treating the case and the technician is responsible for following her instructions. Then I asked her why the teeth are not straight. She told me they were, and then I pointed out the angulation was off and the torque wasn’t right on several teeth and the alignment was not even ideal. I told her it would be helpful to see a lateral cephalogram as the incisors look significantly proclined and appear to need retraction, and that this case may require the extraction of four premolar teeth. She was disconcerted with my answers and recommendation to her and said that she thinks it’s best for the patient to be referred to another general dentist who does Invsialign™ to keep things simple for the patient. The oral surgeon and pediatric dentist who were in the room and witnessed the interaction, both came to me and said that she will figure it out herself after she specializes. She later thanked me for the help and admitted that since she was doing her residency, she appreciated the value in patients seeing dental specialists for their care. Where I practice in Toronto, there are hundreds of dentists providing Invisalign™, and some who treat hundreds of cases each year. These patients often have to spend more money, and have to undergo the burden of additional orthodontic treatment so they can “get it right” by a certified specialist. And sometimes, what has been done is irreversible. When it comes to orthodontic treatment, it is truly a “buyer beware” jungle out there. Invisalign™ and other clear aligner systems are wonderful alternatives to traditional braces that we as orthodontists can offer patients. But don’t be fooled. It’s not like buying a shirt or shoes. The person who is treating you is what is critical to achieve a successful esthetic and functional outcome that can last you a lifetime. 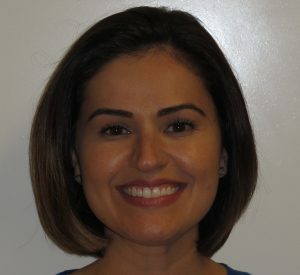 Welcome Sueli to Orthodontics at Don Mills! 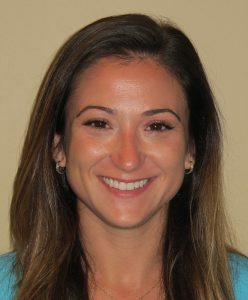 You’ll notice a bright, new beautiful smile at Orthodontics at Don Mills – our new dental hygienist Sueli! Sue beings with her many years of experience working in the orthodontic field. Please join me in giving Sueli a warm welcome to our dream team! My name is Sueli and I came to Canada 15 years ago from Brazil with a dream to become a successful professional. I chose dental hygiene due to previous experience as a dental technician specialized in orthodontics. My career experience is extensive, having worked for various private dental offices, orthodontist offices and dental laboratories. I also has done some volunteer work at Yonge Street Mission which assists young adults that can’t afford dental treatment. I love to work with kids and young adults so this gave me great satisfaction, being able to be a preventive educator and promote oral health. Being an Orthodontic Dental Hygienist is one of my passions. I love orthodontics and I take pride in promoting the best oral health care possible for my patients and the community. I am a also a member of Ontario Dental Hygiene Association and the Ontario Dental Hygiene Orthodontic Study Club. When I am not working, I enjoy spending time with my lovely little dog Heyme, biking, hiking, snowboarding, and roller blading. Merry Christmas Train Graces Orthodontics at Don Mills! Santa drove his Christmas Train through Orthodontics at Don Mills to wish all of Dr. Noble and Dr. Cassolato’s patients a very Merry Christmas! You’re all on the nice list and will be happy Christmas morning. Wishing you all a very Merry Christmas from us all at Orthodontics at Don Mills! This is a special time of year for all of us to be thankful of our blessings and to cherish those who are close to us and relish in the mystery and magic of life. Wishing all our patients and their families a very Merry Christmas and nothing but the best for peace, health and happiness! Welcome So Hyon and Sam to Orthodontics at Don Mills! Greetings! My name is So Hyon and I’m excited to part of the amazing team at Orthodontics at Don Mills! I’m a Level 2 dental assistant and my role is to make sure your treatment is running smooth and to make you feel comfortable! Don’t hesitate to ask me any questions, I am here for you! I am loving orthodontics, what an amazing chance for me to build relationships among these incredible patients and have a chance to influence their lives and give them a beautiful smile – Exciting! In my spare time I am an avid movie-goer and enjoy trying different restaurants. I am tri-lingual and am happy to speak with you in English, French or Korean. I look forward to meeting you!